Engine: Wright R-975-E3 Whirlwind. The engine has flown 2:10 hrs since overhaul. Propeller: The prop has flown 388:50 hrs total. Blades are bare metal inspected every 6 years, hub is bare metal checked every 3 years. History / Markings: Built in 1940 as part of the French order, the Yale was redirected to Canada when France was over-run by the advancing German army. 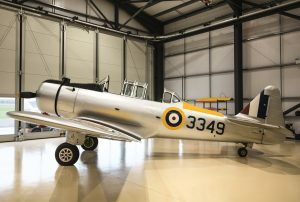 Serving in the RCAF as 3349, the aircraft’s military history is unknown up to the time Canadian collector Ernie Simmons purchased it having seen a disposal notice in 1946, it was then moved to his farm at Tilsonburg, Ontario. When Ernie died, his entire estate, including Yale No.3349, was auctioned off. 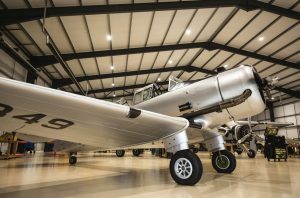 The aircraft next appeared in a restoration shop in Ocala, Florida, USA, where a rebuild to a flyable condition was undertaken. It made it’s first post-restoration flight on August 3, 1980. The trainer attended a number of air displays in North America until it was sold and shipped to Holland, arriving in June 1989. It made it’s debut at Lelystad on June 10, 1989, and was a regular performer at events around Europe for the next ten years, it was first seen in the UK at North Weald fly-in during May 1998. 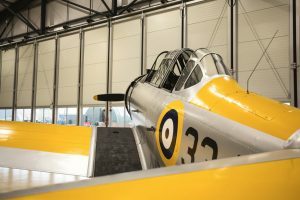 The Yale was ferried into Duxford on March 16 1999 where, starting in the year 2000, it was completely restored by the Aircraft Restoration Company, bringing it up to full Civil Aviation Authority standards. French Air Force NAA-64 in service after World War 2, in French controlled Morocco with a replacement rudder. The NA-64 P-2 was built for the French Armée de l’Air and Aéronavale in 1939–1940, which ordered 200 and 30 respectively. Of these, 111 had been delivered before France surrendered to the Germans after the Battle of France. 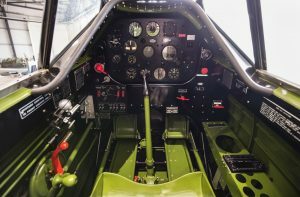 In France, the NA-64, like the NA-57 before it, was known as the North,and was designated as NAA-64 P-2 (abbreviated from North American Aviation modèle 64 perfectionnement, 2 places (North American Aviation model 64 advanced trainer, 2 seats) but were sometimes attached to reconnaissance units. A small number escaped the Germans to be used by the Vichy French Air Force. Two examples in North Africa survived into the postwar years, having been operated alongside NA-57s, the last only being retired in 1949. RCAF Yale shortly after being taken on strength as an intermediate trainer, at Camp Borden. The remaining 119 undelivered aircraft were bought up by the British Purchasing Commission and transferred to the Royal Canadian Air Force (RCAF) for the British Commonwealth Air Training Plan between August and September 1940, and all were operational by November The type was named the Yale Mk.I following British naming practice of naming trainers after education institutions and US-supplied aircraft after American locations, in this case, Yale University, and were used initially as intermediate pilot trainers taking pilots from the de Havilland Tiger Moth and Fleet Finch to the much faster and more complex North American Harvard, until this category was dispensed with as being unnecessary. They were then relegated for use as airborne wireless radio trainers, along with the contemporary Fleet Fort intermediate trainer in 1943. 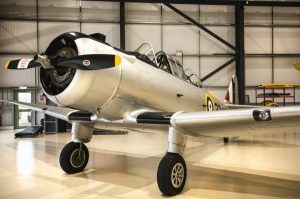 Prior to service entry, the throttle and engine mixture controls were modified from the system used by the French whereby the throttle was pulled back to increase power, and the mixture control pulled back to lean out the mixture, to the system used on the Harvard. The Yale appeared in the movie Captains of the Clouds. The RCAF sold all surviving examples off as scrap in 1946 but over 30 survive today as a result of a large number of them being bought surplus by a single farmer, with about 15 currently in airworthy condition. The NAA-64s captured from the French were used by the German Luftwaffe for all types of flight training, from basic flying to advanced fighter tactics. Dive bomber schools and target tug units and even combat squadrons all used the NAA-64, as they were designated by the Luftwaffe, from the tail markings of the French examples. 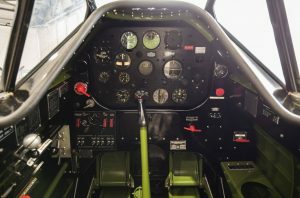 At least one was used by the Zirkus Rosarius to familiarize German aircrew with the handling of American aircraft before they evaluated captured aircraft.